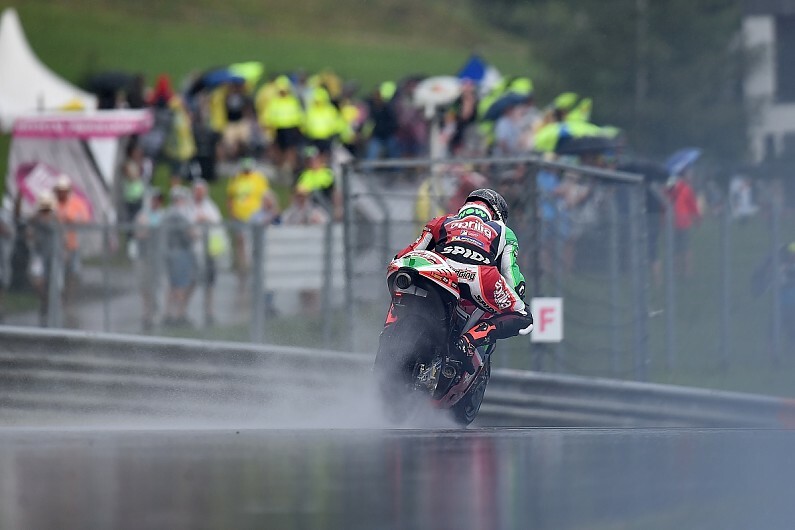 MotoGP points leader Marc Marquez led Aprilia rider Scott Redding in a wet second practice session in Austria. orrential rain hit the track a few minutes before the start of FP2, which led to the session being delayed by 15 minutes. It was still raining heavily when the session did start, and only Alex Rins and Johann Zarco explored the track during the first 10 minutes. Rins was a long way off Andrea Dovizioso's FP1 benchmark and soon pitted, but Zarco stayed out and did several laps on track. The rain soon abated and Zarco gradually improved his time, lapping below the 1m40s barrier at the halfway point. With more riders joining the track, Redding took over the lead, gaining time lap by lap as conditions slowly improved. The Briton 's best time was a 1m34.538s when he pitted with 13 minutes to go, but he was then demoted by Marquez. Championship leader Marquez went faster with a 1m33.995s soon afterwards, just before heavier rain started to fall again - preventing anyone else from making an improvement. Redding ended up second, 0.543s behind Marquez, followed by the satellite Ducati of Danilo Petrucci and factory riders Jorge Lorenzo and Dovizioso. KTM's Bradley Smith was sixth, beating Suzuki's Rins by 0.015s. Jack Miller (Pramac Ducati) was more than two seconds off the pace in eighth, as the top 10 was rounded out by Cal Crutchlow (LCR Honda) and the leading factory Yamaha of Valentino Rossi. Franco Morbidelli, who was 13th fastest, has been given a three-place grid penalty for "irresponsible riding" and impeding Aleix Espargaro at Turn 2 in FP1.